Stop wasting your time going to the video store to rent movies. 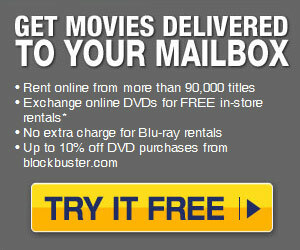 Have Blockbuster deliver the movies directly to your door. Late fees? No more late fees with Blockbuster! Keep the DVD’s as long as you want and return them when you’re done. It’s that simple. Try Blockbuster free for 2 weeks to see how you can easily watch DVD’s straight from the comfort of you own home. They have 3 current DVD plans where you can either choose to have 1 DVD sent to you each time or up to 3 DVD’s at once.